Craving pleasure as well as knowledge, Raphael Sanzio was quick to realize that his talent would only be truly appreciated in the liberal, carefree and extravagantly sensual atmosphere of Rome during its golden age under Julius II and Leo X. Arriving in the city in 1508 at the age of twenty-five, he was entranced and seduced by life at the papal court and within a few months had emerged as the most brilliant star in its intellectual firmament. His art achieved a natural grace that was totally uninhibited and free from subjection. 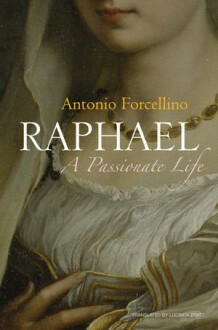 His death, at just thirty-seven, plunged the city into the kind of despair that follows the passing of an esteemed and much loved prince.In this major new biography Antonio Forcellino retraces the meteoric arc of Raphael’s career by re-examining contemporary documents and accounts and interpreting the artist’s works with the eye of an expert art restorer. Raphael’s paintings are vividly described and placed in their historical context. Forcellino analyses Raphael’s techniques for producing the large frescos for which he is so famous, examines his working practices and his organization of what was a new kind of artistic workshop, and shows how his female portraits expressed and conveyed a new attitude to women. This rich and nuanced account casts aside the misconceptions passed on by those critics who persistently tried to undermine Raphael’s mythical status, enabling one of the greatest artists of all time to re-emerge fully as both man and artist.